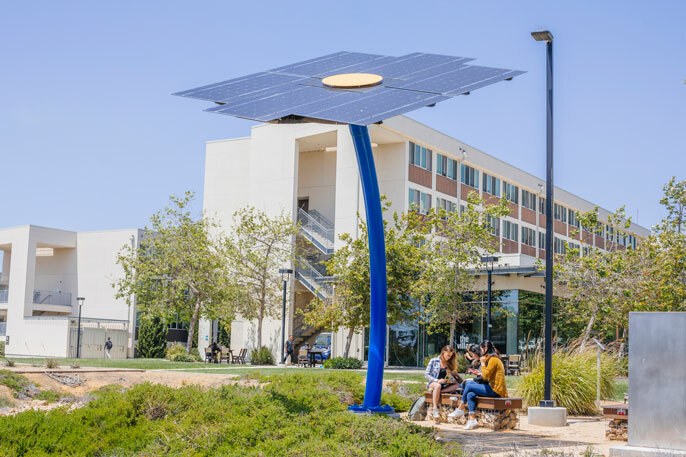 UC San Diego's Solar Chill is an off-the-grid, solar-powered charging station powered completely by renewable solar energy. It is the first student engineering project approved to be built on the UC San Diego campus. 2013: UC President Janet Napolitano launches the Carbon Neutrality Initiative and pledges that the university will become carbon neutral by 2025. 2014: UC registers as an Electric Service Provider, allowing it to supply energy directly to some campuses and medical centers. 2016: UC begins supplying electricity from its 80-megawatt solar farm in Fresno. 2018: UC announces that 100 percent of its electricity will come from renewable or zero carbon sources by 2025. The U.S. Environmental Protection Agency honored the University of California with a 2018 Green Power Leadership Award today (Oct. 10) for its strong commitment to using clean, renewable energy sources. The award was announced during the 2018 Renewable Energy Markets Conference in Houston, Texas, where UC President Janet Napolitano was named the 2018 Green Power Leader of the Year by the Center for Resource Solutions. The award honors her outstanding leadership and influence in support of renewable energy. In bestowing the award, the EPA named UC as one of the nation’s best universities for its use of renewable energy, listing it as 4th among its top 30 green power partners in higher education. About 15 percent of UC’s electricity comes from a mix of solar, wind, biogas and other renewable sources, and the university is ramping up to do much more. Phillips announced earlier this year that UC plans to get 100 percent of its electricity from renewable or zero-carbon sources by 2025, the same year it aims to achieve carbon neutrality. And beginning in June 2019, UC will no longer use fossil fuels for on-site space or water heating in new buildings or those that undergo major renovations. It’s the second year in a row that the EPA has recognized UC’s leadership and commitment to “green” energy, which it defines as electricity that is generated from environmentally-preferable resources. According to the EPA, UC’s current green power use of almost 183 million kilowatt-hours (kWh) is equivalent to the electricity use of almost 17,000 average American homes annually.